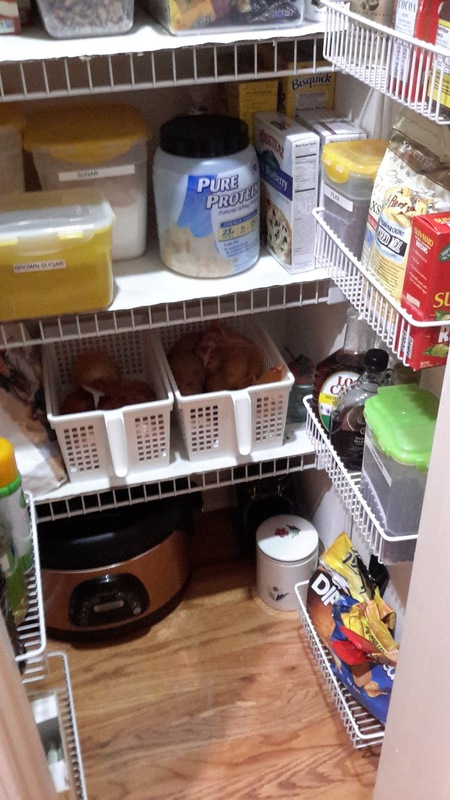 This pantry is only 24" wide so space is at a premium. Shelves were added in an adjoining space to alleviate some of the space issues. Notice the white handled baskets which hold onions and potatoes. It is much easier to grasp a handle than an open bag. Labels were added to all of the baking supplies to simplify selection. Flour and powdered sugar look very similar! The biggest change for this client was the addition of a motion activated battery operated light that was attached inside the closet above the door. The client continually thanks me for the light. Previously she would need a flashlight to find what she needed. Small spaces can be organized!